Did you decide to sell the wife without the second fob??? You’re using the wrong recycling center! What vehicle did you use this with? Interested. First time seeing this - approx How much would it be to program for an rsx? 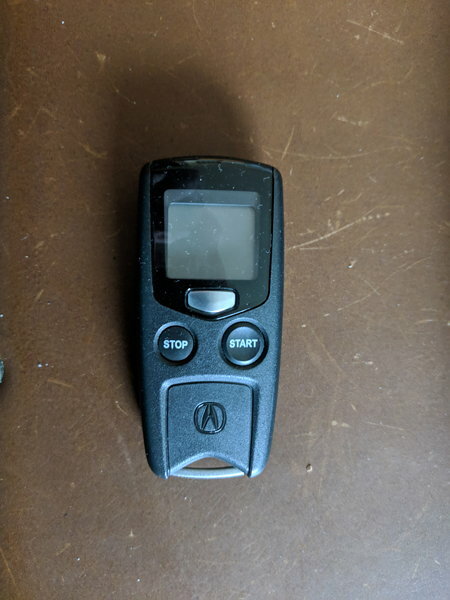 Just to be clear, this is a remote start fob, which means you have to have the remote start function. Will it also open the dorrs and trunk? Yo dude where are the wheels or money!!! Attention!! This guy “stripper4me” took payment for the set of wheels he had for sale a couple of weeks ago and discontinued contact with me without delivery! I want to warn anyone else from dealing with him. He seemed to check as a standing long time member of this fourm but mistakenly i paid him paypal before he delivered the wheels and im now having to look at leagal actions. Yes I have, thank you for your concern Ron A it’s appreciated. I’ve made several refund requests/texts/phone calls to just work out the deal to get me the wheels or pay my money back for over a week and have emailed PayPal about opening a dispute, but it does not fall under the consumer protection policies that have so more than likely it will have to be handled in the courts. Looks like he de activated his account here today. So this dude is on the run now, that’s why he cleared his account. Total scumbag. Ye emailed PayPal about opening a dispute, but it does not fall under the consumer protection policies that have so more than likely it will have to be handled in the courts. How do you reckon? Did you use paypal gift instead of "goods and services"? yes, it must have been an accident on my part, I was using my phone to complete the transaction and the choices are right next to one another and I must have hit the friends request instead. I’ve bought and sold many many used cars parts over the years and never had an issue like this. I haven't had to deal with this situation for a long long time and am very sorry it had to happen to you. Not much I can do about it except ban, which is not much of a punishment since he has already altered his profile to show he has no intention of clearing this up. Hahaha, yeah thanks for the laugh and your reply’s. i just wanted to warn others. Ron A I appreciate your interaction and concerns but all in all it’s just a bit of a shock to me. All was good with our communication and I was totally working with him without issue until he quit all contact and won’t work out the deal to either give me the wheels or my money back. At one point he even offered to give me my money back because it was talking longer than expected to get the wheels to me. I just don’t get it.